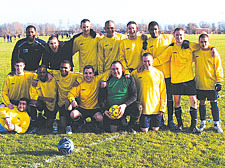 TREBLE chasing Reddot booked their place in the final of the Senior Cup on Sunday with a resounding victory over Archway Allstars at Hackney Marshes. With the Division One title and our Camden New Journal Challenge Cup both still within their grasp, the Dots came from a goal behind to reach this season’s showcase finale. An upset looked on the cards when Archway took the lead against the run of play with a clinical finish by Leigh Hartley. But Reddot hit back when Paul “Trigger” Reid hit two in three minutes, including a stunning volley, before Jason Medford hit a third on the stroke of half-time. Archway got back in the game early in the second-half when Hartley netted his second of the game. But again the Dots responded in style with headers from John Donovan and Steven Bruce before Medford added the finishing touches late on, lobbing the keeper to seal a convincing 6-2 win. Reddot now face Division One rivals Cobden Athletic in the final. Cobden needed extra time to see off a resilient Brasenose side. Goals from Pat Jones and Robert Saint left Cobden drawing 2-2 at the end of a testing 90 minutes. With the game hanging in the balance, Harry Pedersen unleashed a drive from the edge of the box to give Cobden a vital lead. Brasenose battled bravely in a bid to force penalties, but Cobden made the game safe when John Charles slotted home from close range for a 4-2 win. Elsewhere Billy Evans and Ruben Malcom both netted hat-tricks to earn the Constitution a place in the final four of the Junior Cup with a commanding 6-1 win over the Surreal Madrid ‘D’ team. Hornsey also reached the final four as they sealed a magnificent victory over Division Two league leaders DOM. The table-toppers raced into an early lead but Hornsey pulled level with a clinical finish from Neil Webster. The equaliser sparked a Hornsey rally and they took the lead when Paul Harding scored directly from a corner. Hornsey increased their lead when Webster headed home his second of the game and his 100th goal for the club. DOM pulled a goal back, but James Frewin added his name to the score sheet to seal a 4-2 victory for Hornsey. The Constitution and Hornsey will be joined in the semi-finals by the Surreal Madrid ‘A‘ team and CS Maritimo. Meanwhile, Phoenix gained sweet revenge over Tergemo in the only Division One fixture of the weekend. Having lost 3-1 to Tergemo earlier, Phoenix got a perfect start with two strikes by talented 16-year-old Aaron Clarke. Mark “Munchie” Doyle exquisitely chipped a third before James Cole hit his 17th of the season. Skipper Darren May gifted Tergemo a consolation own goal as Phoenix ran out 4-1 winners.